Russian Teacakes…Even Better Gluten Free! These miniature snowball cookies were the foundation of the Christmas cookie baking when I was a kid. They were always made every year, sometimes a second batch had to be baked as we ate them all before the big day! You can use pecans but I rarely do. Some people call them Mexican Wedding Cookies but we called them Russian Teacakes. For me it is not Christmas without these cookies so I was extremely pleased to find a great gf recipe. My sisters think they are better tasting than the old regular recipe! They are easy to make with not too many ingredients. Be careful lifting them off the pan as they are delicate until fully cooled. The texture and subtle flavor of this GF version is actually superior to the wheat flour recipe of my childhood. They are delightful with a cup of tea or coffee. My family clamors for extras to take home! If you like them really sweet sprinkle on extra powdered sugar, less of it makes them perfect for those who are not used to too much sweetness. No one will ever know they are GF and you will get complements on their flavor and texture. This recipe is from Annalise Roberts’ fabulous Gluten-Free Baking Classics with minor changes by me. Enjoy: they are rather addictive cookies! Not the prettiest picture but trust me, these are incredibly tasty cookies! Directions: beat butter and powdered sugar in large bowl of stand mixer until light and creamy. Add vanilla, beat in. Add flour and gum, mix in until well blended, stir in walnuts until distributed. Chill dough for an hour. Heat oven to 350 degrees. Form dough into 1 inch balls. Roll in powdered sugar if you like. Place on cookie sheet lightly sprayed with Pam (not the baker’s version that has flour). Place about 1 ½ inches apart. Bake 13 to 15 minutes until lightly browned on top and bottom. Cool on pan for 5 min and then sprinkle with lots of powdered sugar before placing on wire rack to cool. 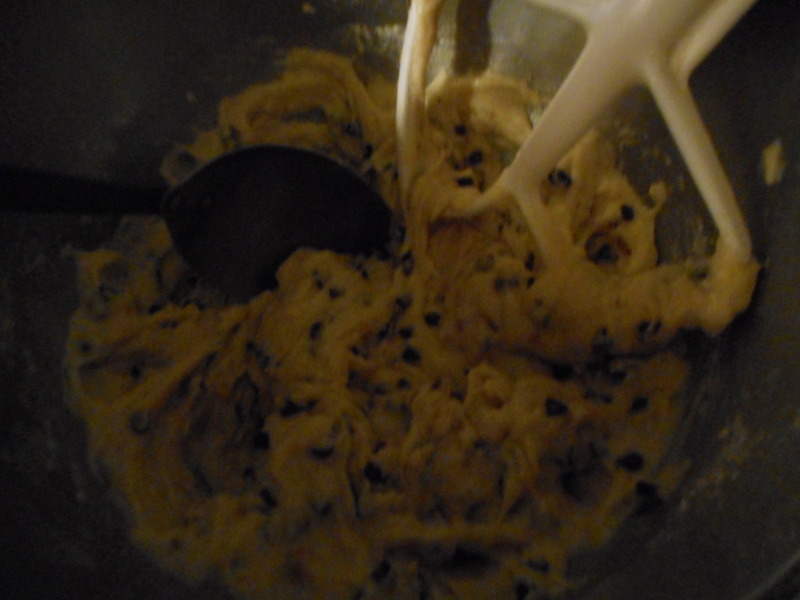 I like to sift it onto the cookies so the coating is even. You could put a sheet of wax paper under the wire rack to catch the excess sugar. Store well wrapped: in airtight container, in fridge for a week or freezer for up to 30 days. You could store unbaked dough in fridge for a few days. Note: First posted December 2014 on my blog. Minor revisions have been made since then. These miniature snowball cookies were the foundation of the Christmas cookie baking when I was a kid. They were always made every year, sometimes a second batch had to be baked as we ate the whole first one before the big day! You can use pecans but I rarely do. Some people call them Mexican Wedding Cookies but we called them Russian Teacakes. For me it is not Christmas without these cookies so I was extremely pleased to find a great gluten free recipe. If you like them really sweet sprinkle on extra powdered sugar, less of it makes them perfect for those who are not used to too much sweetness. No one will ever know they are GF and you will get complements on their flavor and texture. This recipe is from Annalise Roberts’ fabulous Glutin-Free Baking Classics with minor changes by me. Enjoy: they are rather addictive cookies! Form into 1 inch balls. Roll in confectioners sugar, place on cookie sheet lightly sprayed with Pam (not the bakers version that has flour). Place about 1 ½ inches apart. Bake 12 to 15 minutes until lightly browned on top and bottom. If you make them on the large size they will need to bake an extra minute or two. Cool on pan for 5 min and then sprinkle with more powdered sugar before placing on wire rack to cool. Store well wrapped: in airtight container, in fridge for a week or two or freezer for up to 30 days. You could store unbaked dough in fridge for up to three days. Note: First posted December 2014 – on this blog. 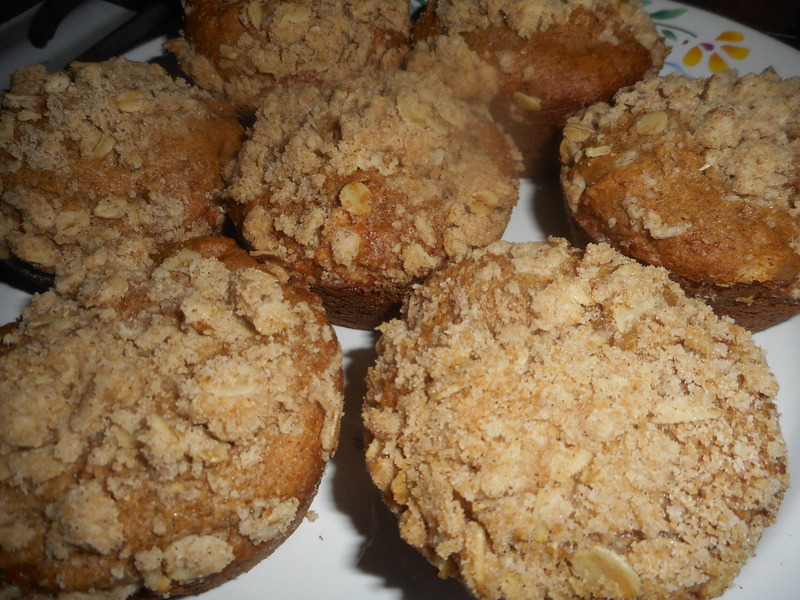 Apple Streusel Muffins: Absolutely Sensational! Fall is the best time for fresh apples and I have a peck of apples right from Bechdolt’s orchards so I figure it is time for a tasty batch of apple muffins. Yes. Muffins. I especially love them because they save me money and I avoid processed foods like the snack bars I used to eat every day. 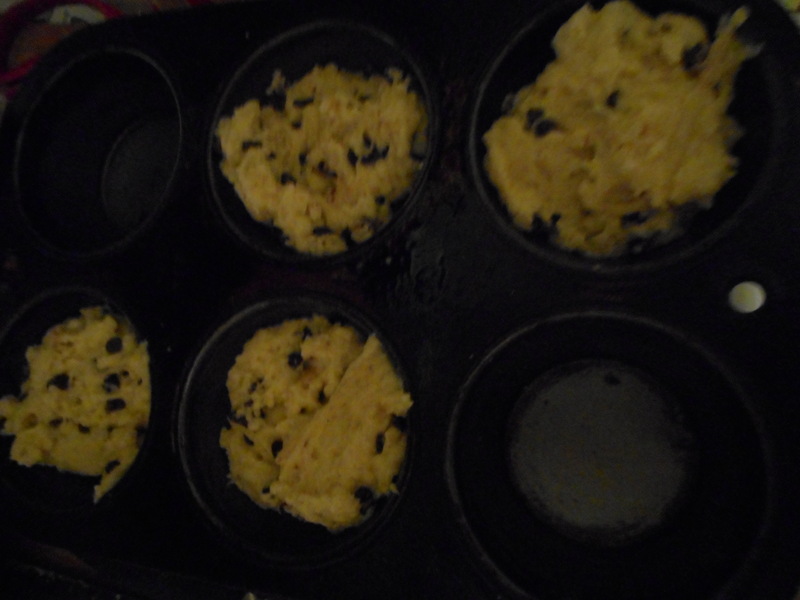 Plus muffins are dead easy to make; no shaping, no tricky steps; dump, mix and spoon into the muffin tin. Couldn’t be easier…. But, most of all they taste fantastic compared to all those commercial snack bars. This is another great recipe out of Annalise Robert’s cookbook; Gluten-Free Baking Classics. It is very similar to her blueberry nut muffins. If I had to have just one GF cookbook hers would be the one for me. I use so many of the recipes and her quick breads are particularly outstanding! 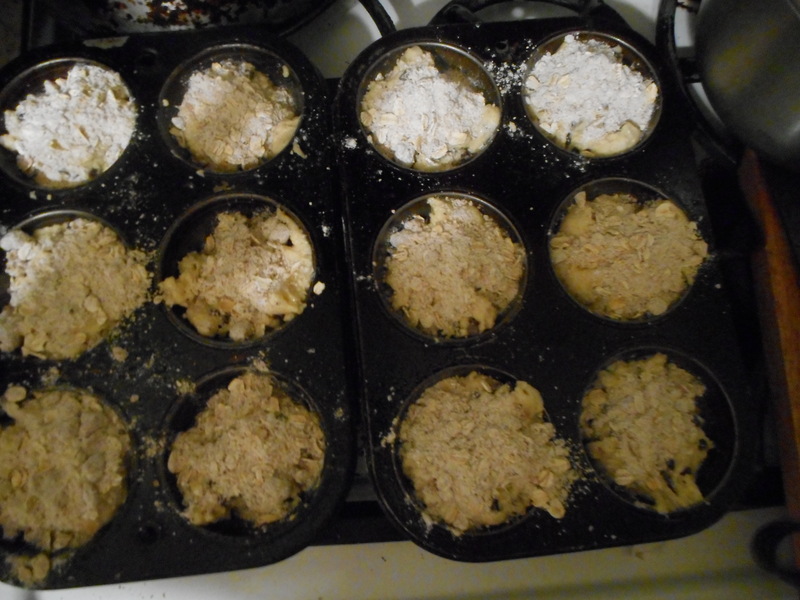 The apple streusel muffins did not disappoint: light, crunchy top with a delicate cinnamon apple flavor inside. I put some golden raisins in my muffins but if you are not a fan; leave them out. They are my favorite addition to this easy to make treat. Do use a baking apple; not red delicious which are solely an eating apple and don’t use a extra firm one like the tasty Granny Smith; they won’t get soft enough during the rapid baking of these tasty little treats. Most any other baking apple will work perfect for these muffins. I like to get a peck of mixed baking apples from Bechdolt’s Orchard: can use them in lots of recipes. I always enjoy eating a muffin still warm out of the oven. It is smart to freeze any you won’t eat in 2 days; ziplock freezer bag works great. These apple muffins are kinda delicate; if you want to take them on a hike or car ride put them in a plastic bin – rigid sides will keep them safe from crushing. 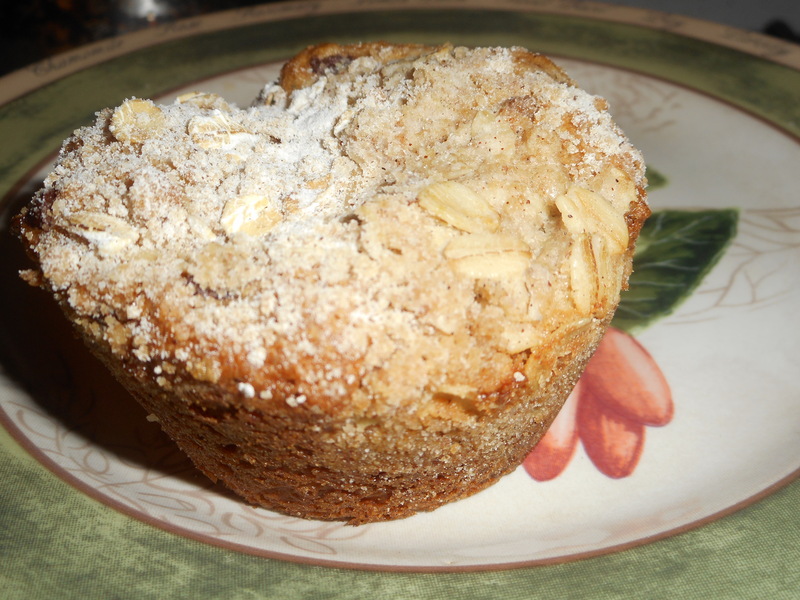 One fat apple muffin…streusel closeup! Topping: Mix the following in a bowl, make sure the butter is in tiny pebbles; use your fingertips to blend. Do this before you mix up the muffins. Directions: Heat oven to 375, placing the rack in middle of oven. Spray muffin pans with cooking spray. One batch makes 12-16 muffins. Combine milk and oil, remove 1 tbsp of combined liquid and ditch it unless you are using the coconut palm sugar; no need to then. You might need an extra tablespoon of milk actually. Beat in eggs. Add liquids to big bowl; stir until blended. Fill muffin pans 2/3 full. I use a big serving spoon filled about half way to dump in each muffin space. Sprinkle the top with streusel mix or cinnamon sugar. Bake 20-22 min until golden brown. Do not over bake or they will taste dry. Remove in 4-5 minutes from the pans and cool on a rack. I use a fork and pry them out one at a time to keep any of the yummy streusel from falling off. Freezes well for up to 3 weeks. Keeps in fridge (well wrapped) two or three days. My love for snacking muffins unfolds further…what new flavor shall I make? Turning to my trusty basic muffin recipe I went for a sweet treat; chocolate chip muffins. They are a riff on my blueberry muffin recipe. If you are wondering why I am posting yet another muffin recipe: homemade muffins are lots cheaper than commercially made GF muffins plus they taste so fresh and oh so tasty. I walk right by all those pricey gf snack bars and cookies; knowing that in my freezer is a zip-lock bag full of luscious muffins that defrost to taste as though I made them that morning. This batch of muffins was delightful: delicate texture yet with a great crunch and the lightly chocolate flavor from the mini chips. I cut back on the chips a bit so they are not too heavy or too chocolaty. The walnuts also contribute to the crunch and add a subtle nutty taste. I added a bit of cinnamon which pulls it all together. The streusel topping gives a great look and adds texture and flavor. I messed up my topping this batch; had to sprinkle melted butter over them after topping. 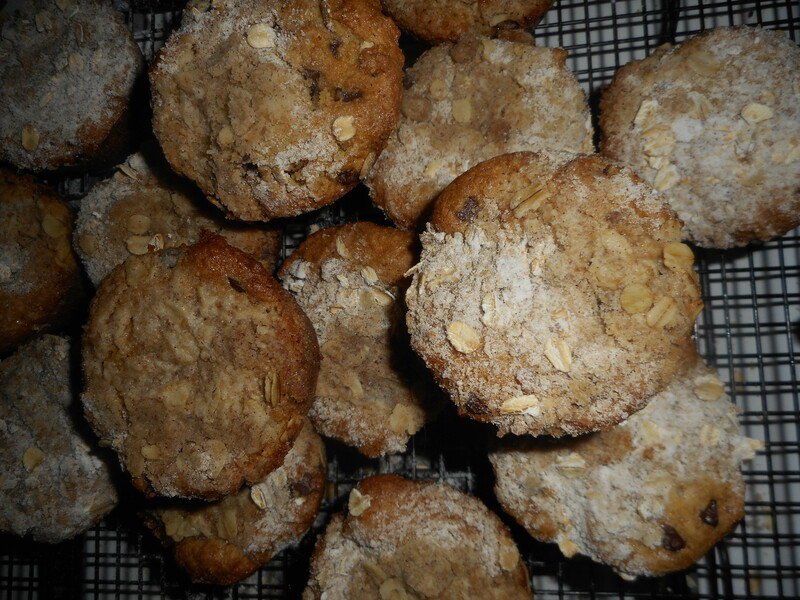 Still yummy but they are slightly bald on top as a lot of the oats didn’t stick properly due to my error. Next time they will be perfect. And there Must be a next time as these sweet treats are awesome! I love how healthy these muffins are compared to commercial gf muffins, no preservatives, chemicals or weird ingredients I would never bake with. Try them and see how eating gluten free can be so easy when you bake your own snacks. As always I freeze those I won’t eat in two days time; a zip lock freezer bag works great. 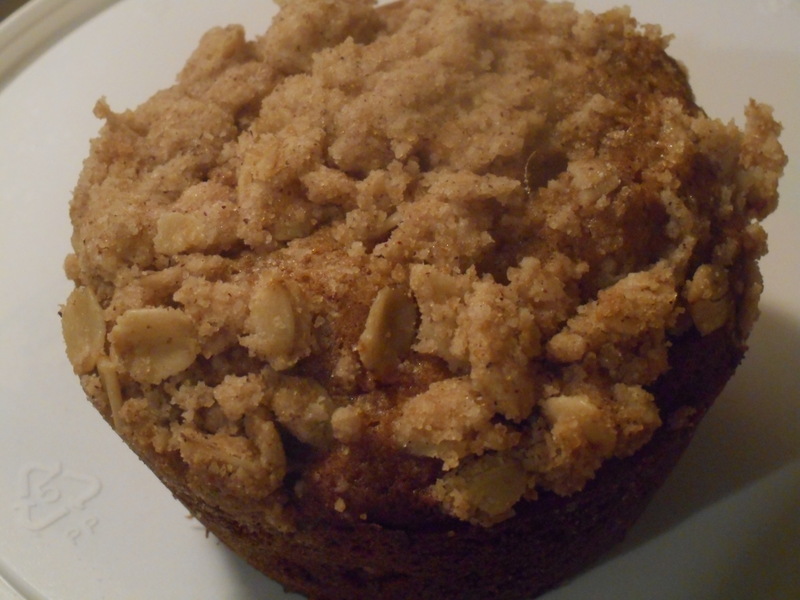 Closeup of the streusel topping. Topping: Mix the following in a bowl, add the butter last after you stir it up a bit: use a spoon to blend. Set aside while you make the muffin batter. Muffin directions: Heat your oven to 350 degrees, placing the rack in middle of oven. Spray muffin pans with cooking spray. One batch makes 14-16 muffins. I got 16 when I made them. Mix all dry ingredients in bowl of stand mixer or big bowl Add chips and walnuts; stir to coat them with dry mix. Combine milk and oil. Beat in eggs, add vanilla. Add liquids to big bowl; stir just until blended. It is a very thick batter. Fill muffin pans 2/3 full. I use a big serving spoon and fill it about half way to dump in each muffin space. Sprinkle the top with the topping. Press it in a bit so it won’t all flake off after baking. Bake 21-23 min until golden brown. Do not over bake or they will taste dry. Remove within 2 minutes from the pans and cool on a rack. They freeze well for a few weeks: if they last that long. Keeps in an airtight cookie jar for 2-3 days.